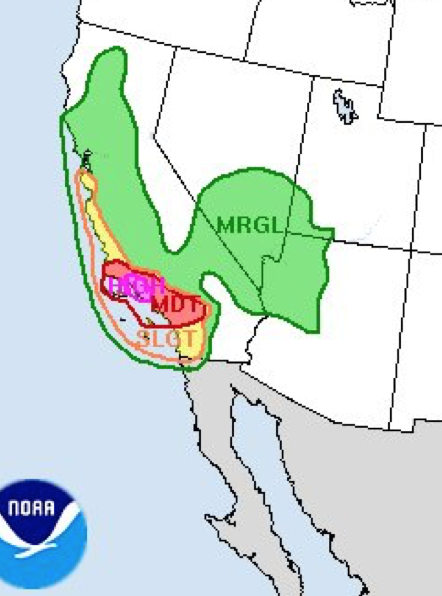 There is a high risk of flash flooding from now until 4am PST Sunday in the purple area on the map between Los Angeles and Santa Barbara and a moderate risk from Orange Co. and the Inland Empire, westward. Something like 80% of all flash flood deaths occur in high risk areas. It is an extremely critical situation. If I lived in that area and was in a relatively safe location, I would think twice about traveling. If you live in a flood or slide-prone area, I would consider proactively leaving.